Pop your petals within the heavy books and allow them to flatten, I left for mine for 3 – 4 hours which was plenty of time! Take your eyelash glue and apply it to the back of one of the petals then adhere it to your skin. I decided to create flower shapes by positioning 5 petals together! 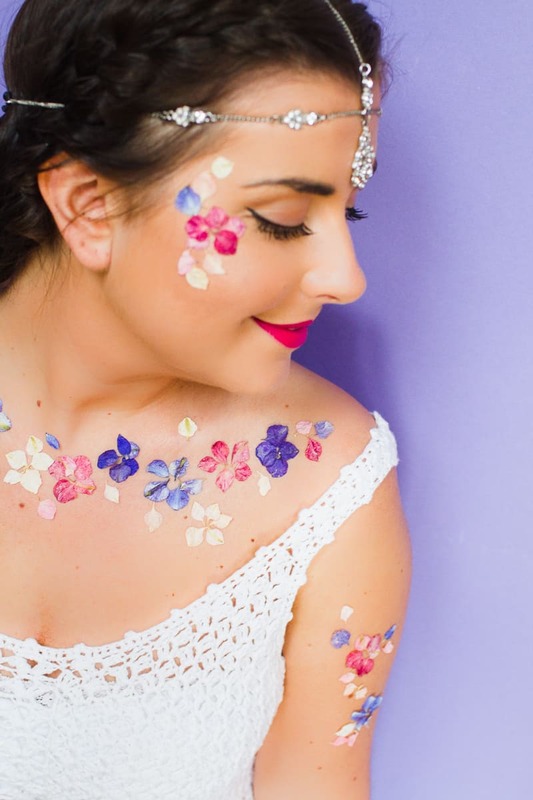 I’ve also read a couple of tutorials online that said you can use vaseline to stick the petals to yourself but this just wasn’t working for me at all, they kept falling off and you obviously want them to last all day on your wedding! Continue adding petals until you’re happy with the design and pattern you’ve created. Finally spray the flowers with a little hairspray to give them a little extra stick! I can assure you that these will stay on REALLY WELL! I got changed with these flowers still stuck to me and not one petal fell off while the clothes were moving over them. In case you’re wondering which petals I used from Shropshire Petals to create this look it was sunshine kisses, candy floss and frosted blue but they have a huge selection over there that you could pick to match the colour scheme of your wedding or just go wild with a bunch of different colours!! Check them out here! And if you love Shropshire Petals as much as we do (seriously, what’s not to love about biodegradable natural confetti?!) then don’t forget to check out our free printable confetti cones we created in collaboration with them and our ultimate guide to natural confetti! thank you for sharing Jessica, the flower is amazing and beautiful ,I quite love it, great features.